Frederick Bell was a LT serving as Flag Secretary and Operations Officer to VADM Thomas T. Craven. When Craven returned to shore duty in 1935, Bell remained on the WV as Main Battery Assistant and Tactical Officer until 1936. 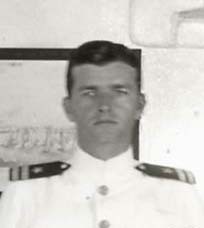 Bell later went on to command the destroyer USS Grayson during the war, earning the Navy Cross during the Battle of the Eastern Solomons in Aug 42. He retired as Rear Admiral. Click here and here for two photos of Frederick Bell with other officers.